Great for the home! These multi-purpose cleaners are designed for almost all household applications. These are safer for the home than most of the common "multi-cleaners". They won't harm pets or the environment. Apply direct 1:1 ratio for tough, hard to remove stains or use w/ pressure washer chemical injector for general cleaning. 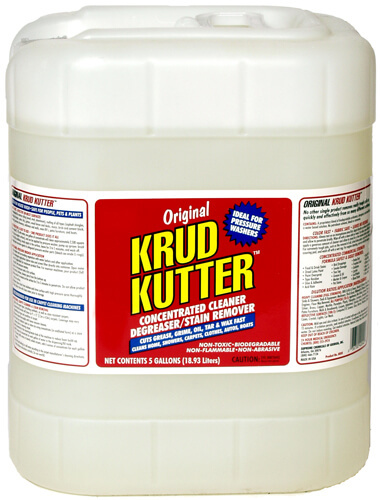 The Original Krud Kutter Concentrated Cleaner & Degreaser. 100% biodegradable, safely removes the toughest stains and everyday messes that most “all-purpose” cleaners can’t touch. No other single product removes really tough stains as quickly and effectively from so many different surfaces! Dilution Ratios: 1:1 to 3:1 for heavy cleaning; 10:1 for all purpose cleaning; 100:1 for reflective surfaces. Earth Friendly: Water-Based. Biodegradable. Non-Abrasive. Non-Flammable, Non-Toxic. Uses no bleach, ammonia, or petroleum solvents. Use on almost any surface except leather or varnished surfaces. The Ultimate, Biodegradable, all-purpose remover. Removes: dried latex paint drips, spills, and over spray. Also removes chewing gum, labels, permanent marker, candle wax, crayons, pet stains, wallpaper adhesive, tape residue, food & drink stains, glue & adhesive, bird droppings, tree sap, oil, grease, shoe polish, mildew stains, scuff marks, soap scum and more. Laundry Stain Remover-Safe for all washable, colorfast fabrics: including cotton, cotton blends and synthetics.